Cooking Light provides recipes for beautiful, delicious & healthy recipes for the 4th of July. I’ll be trying the Pulled Chicken Sandwiches, Red White & Blue Potato Salad, Grilled Corn on the Cobb, Blackberry Cobbler and Watermelon Margaritas. Yum! AllRecipes.com offers many menu options for the 4th of July. From full menu plans to red,white & blue recipes, to favorites for the grill – you can find just about everything by CLICKING HERE. Eating Well also offers a number of healthy 4th of July menu options HERE. They even include a white sangria recipe that looks delicious as a refreshing summer cocktail! Food Network provides quite a variety of Fresh, Healthy Summer menu items – check those out HERE. 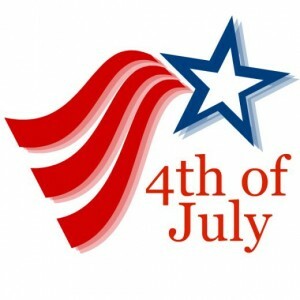 Most importantly – be safe and enjoy your time with family & friends. We have many things to be thankful for – one of which is our freedom. Happy 4th of July & God Bless the USA!